Zombies Set to Invade Landmark Lanes (‘Third Coast Digest’, 16 July, 2010) | Industrial Strength Publicity, Ltd.
Tonight, Landmark Lanes plays host to the DVD release party for Better Than Live, a condensed re-make of George Romero’s 1968 thriller Night of the Living Dead. BTLincludes all of the horror classic’s highlights and is skillfully reenacted by a cast of…puppets? The 30-minute “zany funhouse ride,” as the flier proclaims, is performed by a cast of “theater geeks, mad scientists, and drinking buddies,” according to organizer Billy Ray Olsen. The movie is based on the Night of the Living Dead script and storyline, but takes a few liberties while adding little bits of silliness throughout. 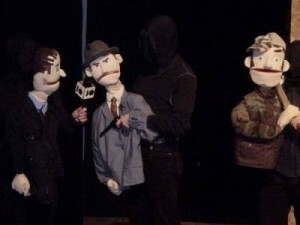 Each puppet is operated by a black-clothed zombiteer, with one hand positioned on the puppet’s head to control body movement and the other on the puppet’s hand, which Olsen likened to bunraku, a traditional form of Japanese puppet theater. “Part of the whole goal is that you can see the puppeteers– we’re black-clad ninjas, but that’s kind of the idea. There’s a sense that this is a low-budget production, the idea that you can see the manipulation,” says Olsen. “I don’t want it to get too polished, because I think we’d lose some of the heart. There’s a sloppy sort of charm that we’ve got,” he adds. Photo courtesy Angry Young Men, Ltd.
Several of the puppets (along with their human operators) will be on hand at the screening and after-party, along with famed horror host Dr. Ivan Cryptosis, the Wisconsin Historical Museum’s curator of the macabre. Angry Young Men Ltd., the name used for the group’s productions, is “misleading,” says Olsen, “because we’re not particularly angry, we’re not getting any younger, and half of the group is women. Really, it’s more of a joke title.” Originally used as a label for a group of British playwrights and novelists who were popular in the 1950′s, the moniker later came to refer to young British writers who, as a group, were disillusioned with the traditions of English society. “If you like fun, if you like horror movies, if you like puppets, if you just like drinking in public– it’s going to be a great party,” says Olsen. Better than Live premieres tonight at Landmark Lanes, 2220 N. Farewell Avenue. Doors open at 7:30 p.m., film begins at 8 p.m. A $1 donation is suggested.